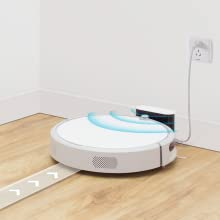 Unlike other robot vacuums, E20 does not randomly bump around your rooms. 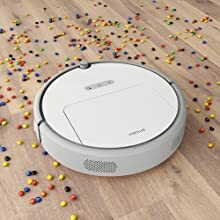 Using dual-gyroscopes and dual-optical motion tracking sensors, it tracks and calculates every movement and creates fast, efficient paths that clean up to 30% faster than typical robot vacuums. 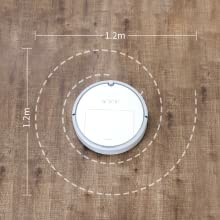 Dual-gyroscopes and high-precision optical tracking sensors allow E20 to clean methodically around a room, starting around the edge then the areas in between. A full suite of sensors gives E20 the intelligence to effectively tackle complicated environments without falling off ledges, getting stuck, or running out of power. 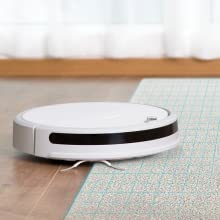 All brushes and wheels are designed to be tangle free, eliminating the need to open E20 robotic mop for cleaning. An included cleaning accessory can be used to remove hair from the outside of the cleaner making it perfect for picking up after your pets. Obstacle crossing: Able to clamber up over obstacles as high as 0.8in, E20 easily handles thresholds, thin carpets, and other low barriers. Carpet boost : When a carpet is detected, suction is increased to maximum to pull up deeply lodged dirt. Once off the carpet, normal suction returns. Washable Filter: A high efficiency E11 filter captures 99.2% of dust and allergens, down to just 0.3 microns. Its washable design extends its life and reduces replacement frequency. 1800Pa of intense suction pulls up pet hairs, pollen, crumbs, and all lightweight debris. It works as well on thin carpets as it does on hard floors. 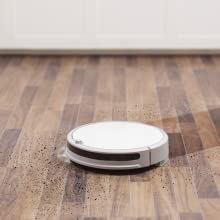 After vacuuming, pick up the finest dirt with the onboard mop. Its water tank allows water to flow only during movement, preventing puddling. 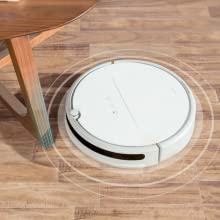 E20 robot slows automatically before bumping into any obstacles, keeping pets, furniture, and children safe. 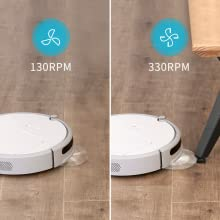 Carpet, Quiet, Mopping, Balanced, Turbo and Max modes give you the flexibility you need, from quiet night time cleaning to heavy dirt removal. A powerful fan works like a cyclone to create intense suction, while a floating main brush hugs the floor. Alongside it are side brushes and rolling brushes. Altogether these brushes clean the floor horizontally and vertically. he charging dock fires an infrared beam that allows E20 to automatically return for recharging. If cleaning was not completed before recharge, it will resume from where it left off. Press the Spot Clean button or tap Spot Clean in the Mi Home app and E20 will draw a 1.2m diameter circle around its current location. 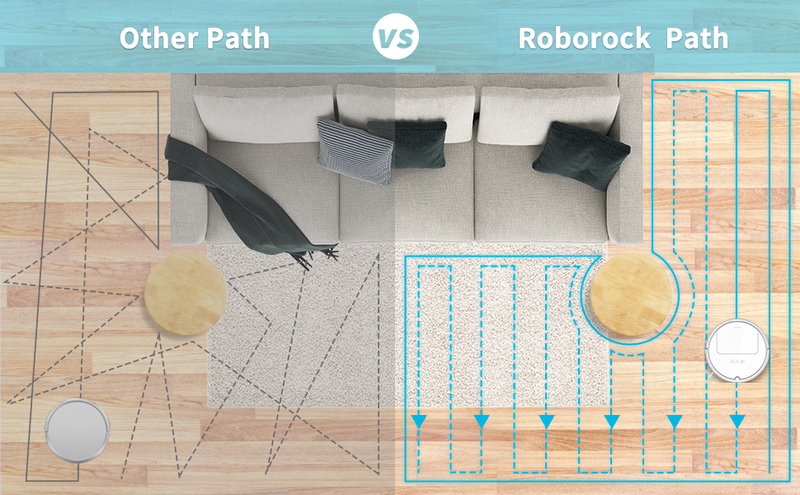 If you have an exact spot to tidy, Spot Clean makes it easy. 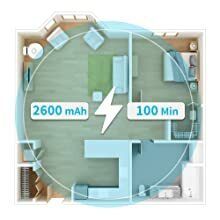 One hundred minutes of battery life mean a whole home can be cleaned in a single charge. I'm very happy to arrive in one day, i'll discuss it. Delivered quickly, tracked. not yet used on shackled everything is worthy. Everything is fine! For 4 days brought to the door!! Everything works, thanks to the seller! Cool vacuum cleaner. Removes, maybe. Beauty. 11 sent. 14 already received. this product is very good! the seller is always ready to help you. Very quickly received, i can not say anything about exploitation yet, this is a gift for the christmas tree for children.